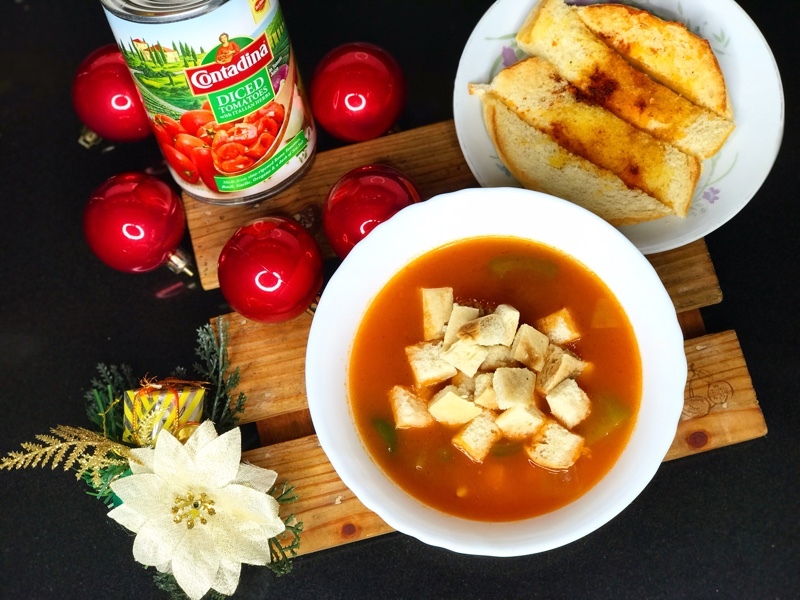 PERFECT FOR HOLIDAYS: #FlavorsOfContadina Tomato Soup + Giveaway! Happy holidays everyone! It's so special to celebrate this time of the year with loved ones cooking, baking, and celebrating the birth of Jesus Christ. As a big thank you to my readers I wanted to do a holiday giveaway and share my latest recipe with you. 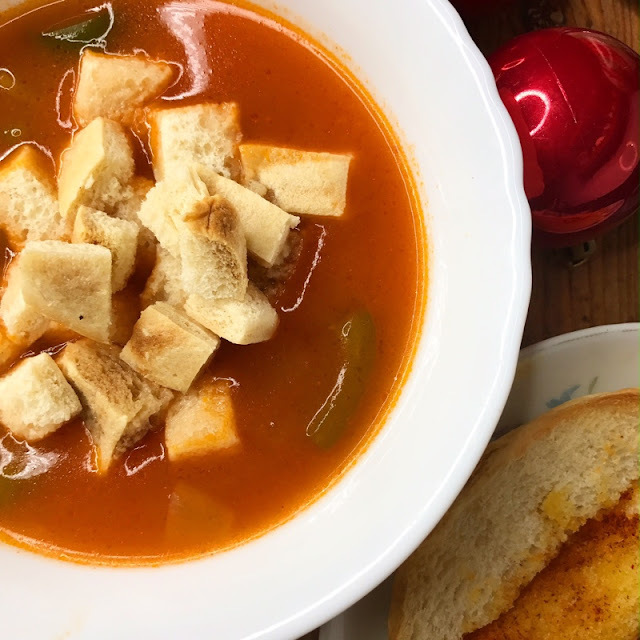 My best homemade tomato soup using "Contadina diced tomatoes and italian herbs", is simple, delicious and perfect for the holidays! 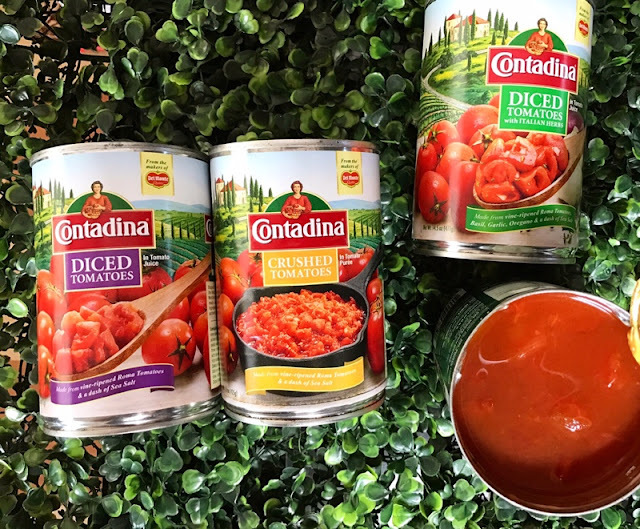 Your family and friends will not believe it comes from a can, because Contadina diced tomatoes are made with love and an abundant supply of sun and nutrient-rich soil resulting in firm cuts that aren't lost after cooking and a delectable, fresh tomato flavour that enriches your recipes. Give it a try and you won't be disappointed. Enjoy! To begin, Put in Contadina diced tomatoes and stir to combine. Add the tomato juice. Next, add 1 or 2 tablespoons chicken base. You can add green bell peppers and corn. Stir to combine, then heat almost to a boil. You can make almost endless dishes with Contadina products. I also cooked this delicious pasta using Contadina penne and Formaggio Pasta Sauce. Oooh, la la! One winner will win this Contadina Holiday Gift Basket. Congratulations Nerisa Nunag You won my #FlavorsOfContadina Giveaway! Please email me at rochellekawasaki@gmail.com for details on how to claim your prize. want to cook pasta arrabiata, Baked cheesy meatballs and Puttanesca! My fam would surely love it! I want to cook Meaty Spaghetti with Contadina Goodies. Normal as the ussual but my kids really love meaty spaghetti and it is important to me to cook what my kids really want to eat. And at the end,they are smiling saying that my spaghetti is the best lalo na kung Contadina ang matitikman nila. joining! My little boy loves spaghetti and I plan to cook it using these Contadina products. 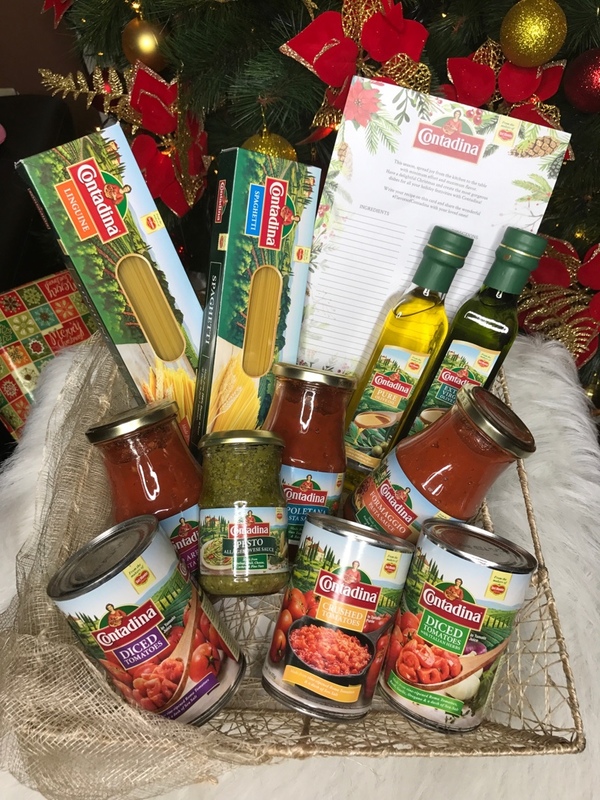 My little boy loves spaghetti and that is what i plan to cook using these Contadina products. Great Recipe Ms. Rochelle! This Holiday I will cook Spagetti & Meatball Bites using Contadina base in your recipe, my kids surely love this, thank you for your tips. Good luck and have a fruitful years ahead! I will cook meaty menudo our favorite this christmas using contadina tomatoe sauce this is perfect for whole family! I will cook Spaghetti with meatballs as per my hubbby's request. Many thanks and merry Christmas! I will cook my family's favorite Sweet Spagetti meatballs this christmas eve,they will surely like it because they appreciate the love and effort i give everytime i cook for them. I love that simple recipe Ms Rochelle, I'll try it :) thanks for sharing. I am planning to cook a menudo,creamy cheesy spaghetti,and I want to bake a lasagna for my family using a contadina gift pack..
January is my Birthday Month and this is perfect for a Chicken Pesto Pasta that my lil Roczi & hubby favorite dish and also will try have Ms Rochelle Tomato soup.. If i won in this blog i will cook cheesy spaghetti sardines for my family.. A uniquely blend of sardines on a pasta sauced with creamy cheese.. Perfect for on a diet... With garlic bread! 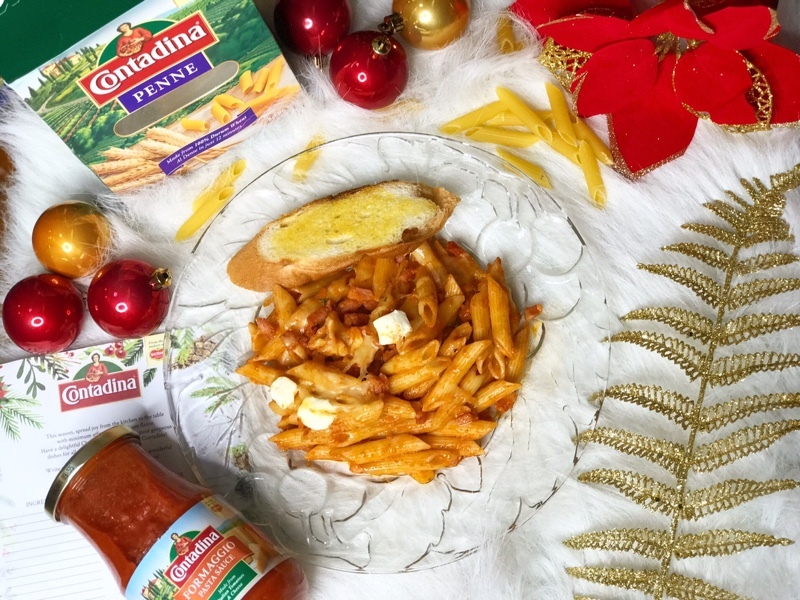 I plan to cook my family's all-time favorite Spaghetti with Contadina goodies. I do cook but not that often. When it comes in cooking dishes or pasta, there are times that I am experimenting using different products. Reading your blog, I am excited to try your ContadinaTomato Soup Recipe. My wife loves soups, almost all sorts of soup (but not the spicy one). She will be surprised if I will cook this for her and I am excited to see her reaction as well as my daughter's verdict when I cooked it for them. I am confident that they will love it because I will used Contadina product this time. My hubby and I loves to eat and one of the food that we will not miss if we are ordering pasta is the Pesto Pasta. I have researched a perfect recipe in cooking Pesto Pasta and I am excited to cook it using Contadina products - Pasta Linguine and Pesto Sauce. I am not a good cook but I want to perfect this one using Contadina products and I am pretty sure that my hubby and my daughter will gonna love this one. I plan to cook Spaghetti and Meatballs Bites for my family. I want to try your recipe, using the Contadina products. Perfect for merienda and any occasion. I wish to have these Contadina goodies. Happy New Year and Happy Three Kings!